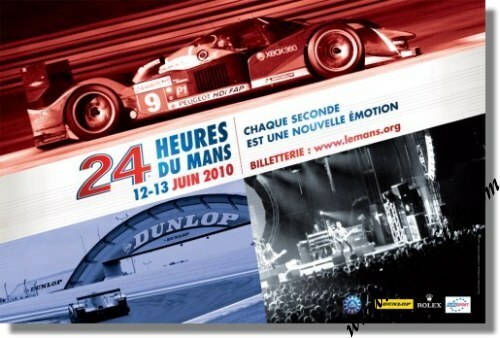 Original 2010 24 Hours of Le Mans Poster. The 2010 Le Mans poster is part of the era in Le Mans posters which is generally described as "The Le Mans Poster in the era of computer graphics and sponsorship" and which lasts from 2001 until the current day. The 2010 24 Heures du Mans poster was produced by Agence La Fourmi after photographs by A. Cornilleau, G. Rousseau and J.P. Boyer. The poster shows a new approach for a new slogan - "Chaque seconde une nouvelle emotion" which translates into "Every second a new emotion". The poster is not only focused on the race but also on "life" around the track.